This is a piece I wrote a few months ago and forgot to post. So ignore the obvious references to warm weather (snow is predicted tonight; lunches on the deck are now but a dream) and enjoy the food. Company this weekend. Tom’s family came for lunch on the deck (sandwiches and Roasted Potato Soup). Our pups were in heaven; not one but two dogs to play with! Steve’s goldendoodle River towers over our girls with her long, long legs, but plays very nicely; my mother-in-law Mary’s cairn terrier Barney holds his own with the crowd of large, rambunctious females. I stopped by the farm market late in the afternoon, to find inspiration for dinner. There was a basket of small, cone-shaped red chiles that looked very much like my beloved Fresnos. I didn’t know that we could grow them in Wisconsin, so I asked for an identification. “Hey, what kind of peppers are those little red ones?” the woman behind the counter shouted to someone in the back. “Chiles!” came the answer. “Not too hot.” Well, that narrowed things down. I came home with an orange bell pepper, a handful of those unnamed chiles, and some deep yellow summer squash. 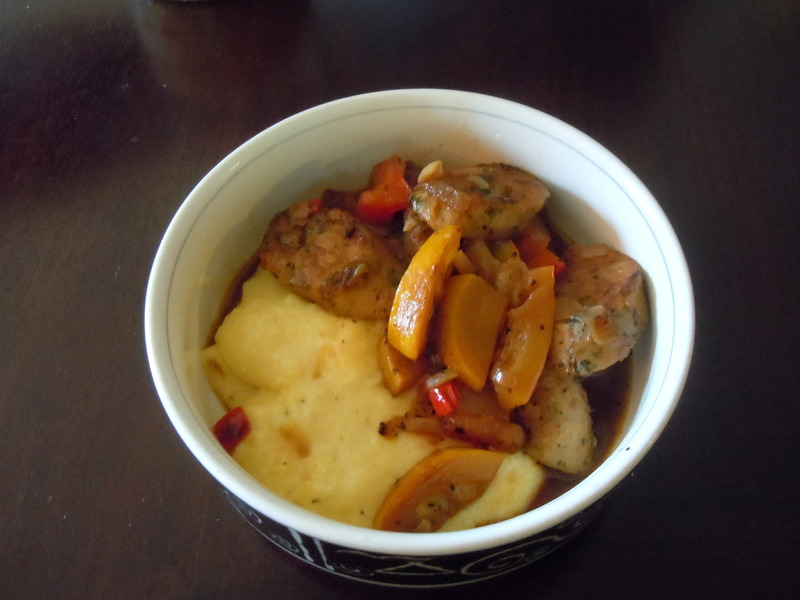 With the chicken sausage I had in the fridge, they’d make a nice stew to serve over polenta. Browning the spicy sausage first creates a fond, the fancy French name for those brown, intense flavor bits that stick to the pan. Tip the toasty sausage into a bowl, put that messy pan back on the heat, and add the veg. The natural liquid in the onions and squash will help to loosen the cooked-on bits. The result is a deeply flavored, colorful stew that tastes rich but isn’t heavy. Soft polenta is sophisticated comfort food, and is the perfect mellow base for the stew. Speaking of healthy dinner, you can make the polenta with just water, or water plus chicken stock, for a nearly fat-free dish. We like the creamy texture of the polenta made with milk. Polenta sets up very quickly once it’s cooked, so make sure the stew is ready before the polenta is. If you have a good kitchen helper in your house, the helper can cook the polenta while you make the stew; they take about the same amount of time. Pour the water, milk, and 2 CUPS OF the stock in a medium saucepan over medium heat and slowly bring to a boil. While that gets hot, put the oil in a large skillet over medium-high heat. When the pan’s hot but not smoking, add the sausage. Cook for a few minutes until it’s well browned. Pour the sausage into a bowl and set aside. Add the onion and garlic to the pan; cook for 1 minute until the onion is softened. Stir well to loosen all those flavor bits on the bottom of the pan. Add the chile, bell pepper and squash and continue cooking for about 5 minutes until the veg are softened and browned in spots. Add a tiny bit more olive oil if the veg are sticking too much. Add the remaining 1 cup stock to the pan along with the thyme. Give a good stir, then taste. Add salt and pepper. Turn the heat to medium-low and let it simmer while you make the polenta. Your polenta liquid in the saucepan should be gently boiling by now. (If not, boost the heat until it is.) Arm yourself with a whisk, and have a wooden spoon close by. Add the polenta in a thin stream as you whisk constantly; this is how you avoid lumps. Once all the polenta is whisked in and the mixture is starting to thicken, stir in about 1/2 tsp. salt and lower the heat to medium-low. 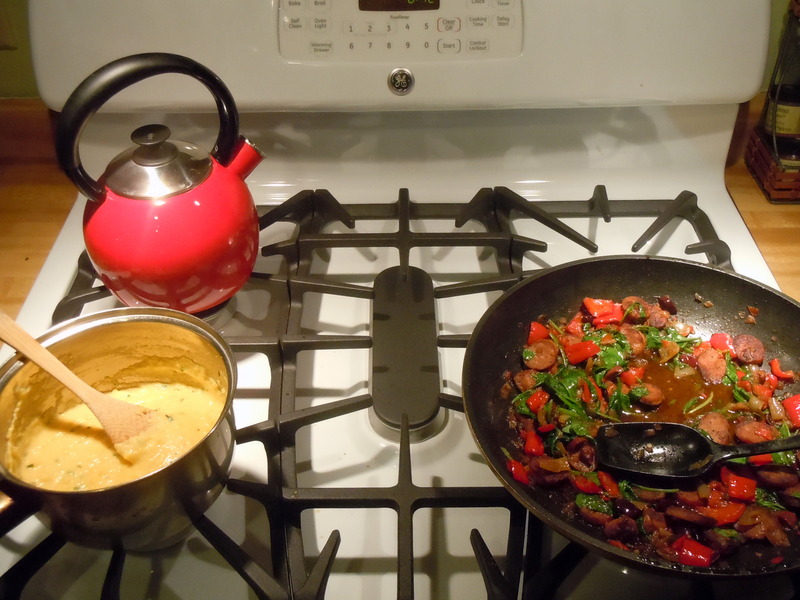 Cook for 15 to 20 minutes, stirring every few minutes, until the polenta tastes smooth and no longer gritty. If the polenta is thicker than you’d like, stir in a few more tablespoons of milk. Stir in the 1/2 cup cheddar until melted. Immediately spoon the polenta into bowls, top with the stew, and serve. We like a sprinkling of chives or parsley on top. We set out a bowl of grated cheddar just in case the polenta isn’t cheesy enough. This entry was posted in main courses, meat, poultry,and fish, pasta, rice, and grains and tagged bell pepper, cheddar, cheese, chicken sausage, chile, pepper, polenta, sausage. Bookmark the permalink. I asked Mr Google “what to server over polenta” and found this little treasure. Loved it! The great flavor belies that fact that it took only a half-hour from start to finish!! That I had everything I needed right here at home just added to my pleasure. ❤ My only change was to omit the cheddar from the polenta since my secret to making it luscious is to add a couple tablespoons of cream cheese to it as I'm taking it off the stove. Now I'm off to see what other goodies you have posted! Thanks so much! I love the idea of cream cheese in the polenta. We’ll have to try that soon.